To pay your dues online, please click on the button below to get started. Of course you may always phone member services and pay over the phone (206.244.8541). June 30th continues to be the date for paying on time. If you are renewing your dues after June 30 a late fee will apply for both the Northwest Division and National when renewing online, by mail or in person. Yes even the President of PSIA-NW, if paying late, incurs the late fee. Yes, that’s right! You asked, we listened. 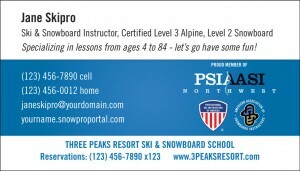 Your digital membership card is now available through your snowpro account. You can download and save your current membership card so it can be available on any device. Every season you need to participate in a one day event. If you participate in a multi-day event, then you would need to participate in something not the immediate next season, but the following season. A season for us is just like a season for you in snowsports. Our fiscal year runs July 1 – June 30, so participating in anything on the calendar for the current season provides you credit for the season, be it participating in something in October or April of the season. If you have any questions or this is confusing, please give us a call, we’re happy to review your education history and go over it with you. Because teaching others to love snowsports rocks! And you get to live the coveted mountain lifestyle. You are an important part of a dynamic membership here in the Northwest. In part, your organization’s healthy growth has come from the efforts of members, such as you, who continue to spread the good word about PSIA-AASI and the many benefits you receive. What follows is a list of benefits provided to all members of the Northwest! This is a huge member benefit available exclusively to you, not to be used for family, friends or re-sale. The PSIA-AASI Accessories Catalog, published annually both online and in print, offers accessories that show your pride in the association. Working with corporate sponsors and other companies through PSIA-AASI’s Official Supplier program, you will find other pro offers on their website. These offers include ski and snowboard gear, magazine offers and much more. Each of these programs can be worth many times your annual PSIA-AASI dues. For example, PSIA-AASI’s partnership with Volkswagen means substantial savings to you and support for your association as well. Benefits to you from PSIA-AASI Official Suppliers are constantly changing so click here to login to your account and view them. This is a member benefit available exclusively to you, and is not to be used for family, friends or re-sale. Please be respectful and courteous when presenting your membership ID for a discount at the host resort. A benefit of membership in both PSIA-NW and PSIA-AASI is a subscription to each magazine. PSIA-NW’s NW Snowsports Instructor Magazine and PSIA-AASI’s 32 Degrees: The Journal of Professional Snowsports Instruction, the definitive publications for staying on top of the latest in teaching alpine skiing, snowboarding, nordic skiing, and adaptive skiing and snowboarding. Members receive three issues of each annually. PSIA-NW makes available a wide range of books to support the national standards and PSIA-NW’s education programs. These are made available at the lowest possible cost to the member and can be found on our website, click here. You’ll also find some awesome PSIA-AASI Northwest Division merch to rep, like sweatshirts, notepads, and water bottles! Get 250 or 500 “pro quality” business cards, professionally printed and shipped UPS right to your door, complete with personalization options and official PSIA, AASI and Northwest logos. Plus your purchase will support the PNSIA-Education Foundation with a $2 donation per order given to the scholarship fund. Click the example card for an enlarged detailed view. PSIA-NW education events are held throughout the region each season. These are invaluable opportunities to improve your skills as a teaching professional. These clinics and seminars are designed specifically to improve your skiing or snowboarding technique and your teaching. You’ll learn more, challenge yourself and have fun while doing it! You know the saying, Learn, Teach, Inspire. Visit our event calendar to see what is offered. Your certification is recognized across the country and can mean increased wages, additional benefits and recognition. 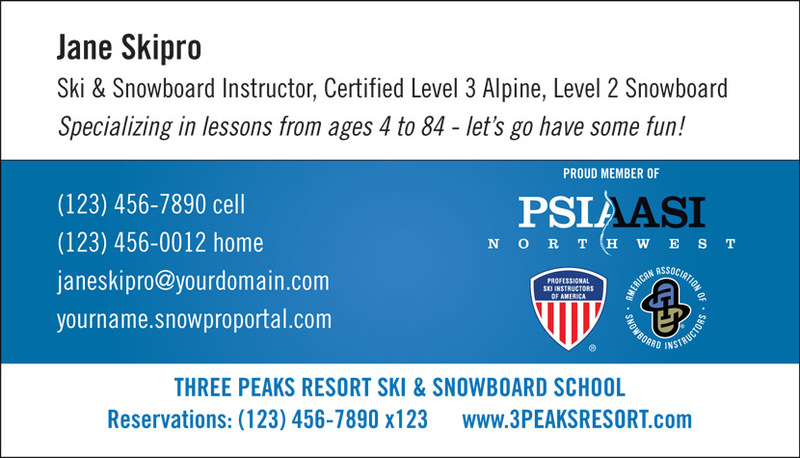 Certification exams are offered by PSIA-NW each season throughout the region. Level III certified members may also join ISIA. Learn more about certification here. and others to increase industry and public awareness of the value of professional teaching. PSIA-AASI is represented at the NSAA convention and SIA trade show. Additionally, PSIA-AASI works with industry media, sponsors, and supporters from outside the ski industry to promote snowsports. Your Northwest Board of Directors continually looks at ways to improve, all with an eye toward increasing the value of your membership. The PSIA-NW staff and leadership are committed to maintaining high standards in service and quality. Please contact us anytime info@psia-nw.org. Please click the button below if you would like to transfer and to find out more information.